The Elberfeld case has attracted official attention from President Johnson and some of his advisers. Friday Messrs. Johnson, Comiskey, Postal, and Angus met in Detroit to talk the matter over. After the cabinet meeting no news was given to the public. so every One is end-tied to a guess. With Comiskey in the conference, it would seem that George Davis and Elberfeld would figure in a deal. 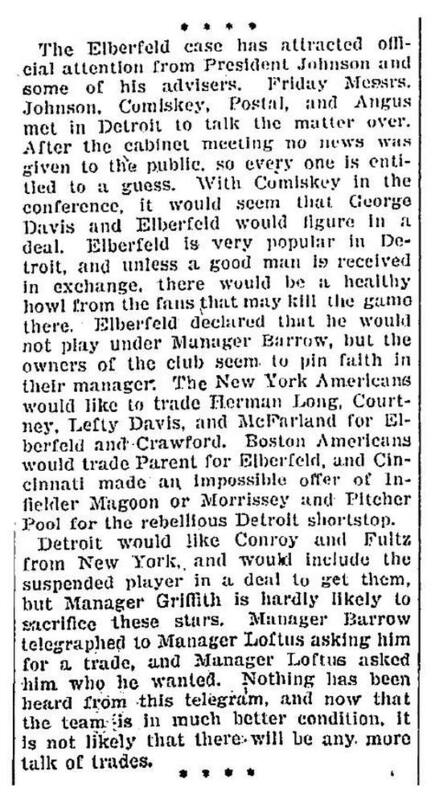 Elberfeld is very popular in Detroit, and unless a good man is received in exchange, there would be a healthy howl from the fans that may kill the game there. Elberfeld declared that he would not play under Manager Barrow, but the owners of the club seem to pin faith in their manager. The New York Americans would like to trade Herman Long, Courtney, Lefty Davis, and McFarland for Elberfeld and Crawford. Boston Americans would trade Parent for Elberfeld, and Cincinnati made an impossible offer of Infielder Magoon or Morrissey and Pitcher Pool for the rebellious Detroit shortstop. Detroit would like Conroy and Fultz from New York,, and would include the suspended player in a deal to get them, but Manager Griffith is hardly likely to sacrifice these stars. Manager Barrow telegraphed to Manager Loftus asking him for a trade, and Manager Loftus asked hint who he wanted. Nothing has been heard from this telegram, and now that the team is in much better condition, it is not likely that there:. will be any. more talk of trades.